04/22/2016 – Update v7.1 File Browser, Steam Cloud & Lua Scripting Updates! A major improvement this update is the addition of the new File Browser where you can import files from your computer in game. This will make your game creations faster and less reliant on external hosts. Additionally, we have a ton of updates to Lua Scripting and have improved the Joints menu making it easier for more people to utilize them. 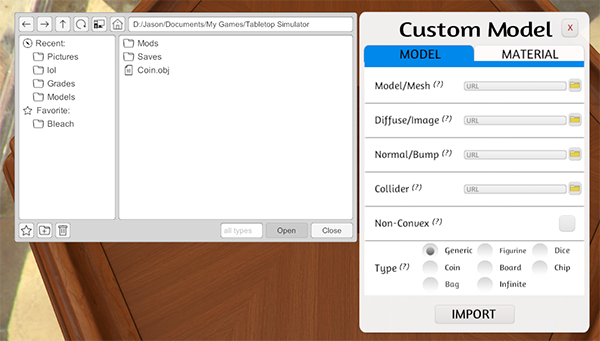 Be sure to check out our Knowledge Base for tips, tricks and a lot of info on how to use Tabletop Simulator. You can now easily import files from your computer into your games to create custom content. You can choose from using Steam Cloud to import files or your local files. Use local files for internal testing. (This will not work in multiplayer). The browser lets you create favorites, view your recent folders, create folders and much more! To bring up the file browser just click the folder icon next to any URL input field. You can now use the in-game File Browser to import files to Steam Cloud. This is a great alternative to using external image hosting sites. Use this option when you will be sharing your games for multiplayer use. You can manage files uploaded to the cloud with Menu -> Cloud. From the Cloud menu you can delete files or preview them by clicking on them. There is a 1GB limit on your Steam Cloud. Fixed setTable() not working correctly when called from the Global script. Added default pokerchips’ values to getObject(). Changed spawnObject() to no longer snap objects to the grid by default if the grid is turned on. Added optional “snap_to_grid” parameter to allow spawnObject() to snap to the grid if the grid is turned on. Changed takeObject() to accept an array or table for position and rotation. Changed scaleAllAxes() to overload scale(). Fixed 3D UI buttons not hiding in hidden zones. Added Lua script_code member variable for Objects. Added auto updating to Lua Atom Plugin Editor. Added getCustomObject() function to Object. Adding script to an object automatically opens it in Atom Editor if Atom is open. Loading a game automatically uploads all the scripts to Atom if Atom is open. All print() functions upload their messages to Atom’s console (ctrl + alt + i). All Lua errors are uploaded to Atom’s console. Changed scaleAllAxes() to scale() overload. Fixed issues with Lua Atom Editor plugin. Prefer another text editor other Atom? Take look at our External Editor API to make your own plugin. 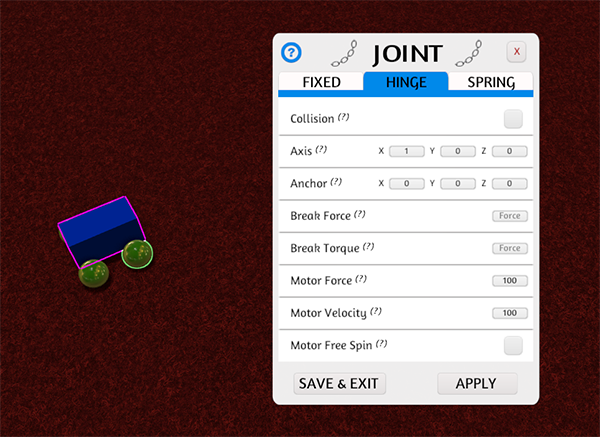 Joint menu will now be initialized with the value of the current joint. The object that it is jointed to is now highlighted in a dark pink. This should allow you to figure out how people have created their joints, making it easier to understand and create on your own. Fixed base game territories to their proper images. Added standing/laying down states to Meeples. Added Hidden Zones at each seat for dice rolls. Lua Buttons are no longer visible in Hidden Zones. You can no longer activate the UI by clicking the MMB. More optimizations to reduce stutters. Fixed issue with MMB toggle zoom being activated instead of flip when bag search is open. Fixed issue with Infinite object preview being massive. Fixed issue with the chest saved objects drop down menu trashcan showing and disappearing after hover. Fixed issue with late joining player loading google.com on tablet. Fixed blocky fonts on Mac. Fixed issue with Teal and brown names not showing up on table surface. Fixed lift height issues with jointed objects. Fixed issue with cloud syncing on Mac and Linux not working. Fixed issue with Tablet not working on Mac. Fixed issue with search bags with custom objects. Fixed camera floating away on certain saves. Fixed box selection not working on certain saves. Fixed adding object to search menu would flicker and not work. Fixed being able to adding an object to itself with search. Fixed pointers not hiding in hidden areas. Fixed background in the RARRR!! DLC. Fixed issue with sliding cards under bottom of decks not working with smaller deck sizes. Fixed certain sounds being 3D positional when they shouldn’t. Fixed infinite bag objects not being properly scaled down. Fixed issue with objects casting shadows with holes. Fixed flipping object with middle mouse in search menu. Fixed trash cans showing up incorrectly in saved objects. Fixed issue with custom material not assigning correctly. Fixed issue changing texture on duplicated object change it for clones.